Fleming, Ian -Former British intelligence officer (1908–1964) whose novels featuring suave spy James Bond have attained unprecedented and seemingly indestructible popularity in more than twenty film adaptations over the course of five decades. 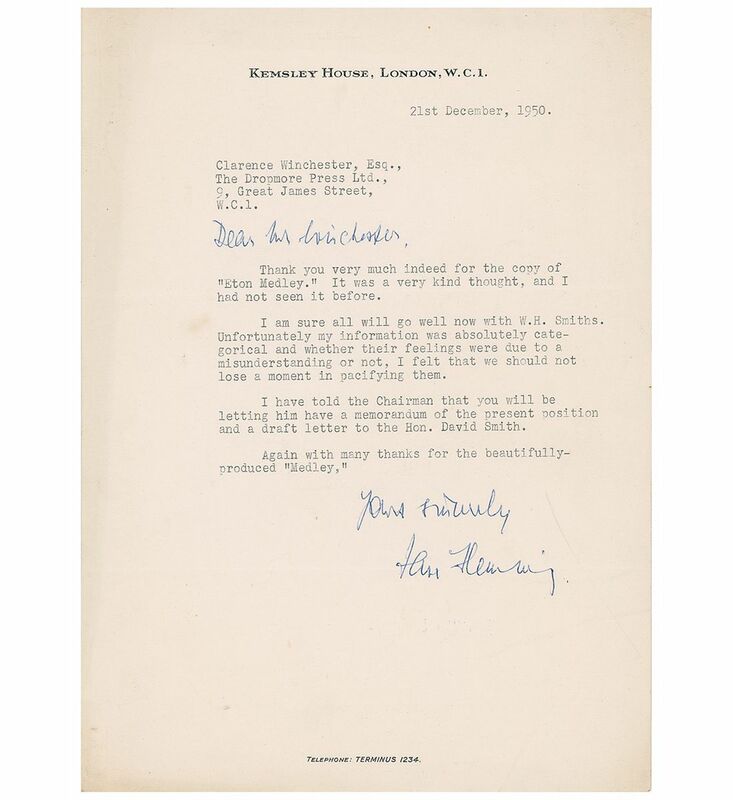 TLS signed “Yours sincerely, Ian Fleming,” one page, 8 x 10, Kemsley House letterhead, December 21, 1950. 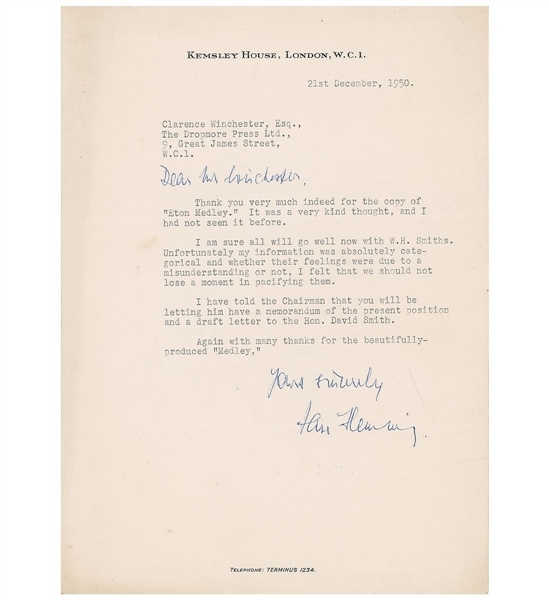 Letter to Clarence Winchester at The Dropmore Press Ltd. In full: “Thank you very much indeed for the copy of ‘Eton Medley.’ It was a very kind thought, and I had not seen it before. I am sure all will go well now with W. H. Smiths. Unfortunately my information was absolutely categorical and whether their feelings were due to a misunderstanding or not, I felt that we should not lose a moment in pacifying them. I have told the Chairman that you will be letting him have a memorandum of the present position and a draft letter to the Hon. David Smith. Again with many thanks for the beautifully produced ‘Medley.’” Fleming has also handwritten the greeting at the top of the letter. Some scattered creases and wrinkles, and some mild toning, mainly to the edges, otherwise fine condition. Around 1950, journalist Ian Fleming joined the Dropmore Press as a director. This letter to its editor, Clarence Winchester, mentions “Eton Medley,” which was B. J. W. Hill's book written about Eton College. As a youth Fleming had attended Eton but was kicked out—a piece of his own history that was added to the dossier of his most famous literary character, James Bond. By 1952, the spy was born, and Casino Royale was published the following year. The Dropmore Press slipped into severe financial difficulties in 1954 and closed shop in 1955. Fleming went on to write thirteen more Bond novels and secure his place in modern fiction.